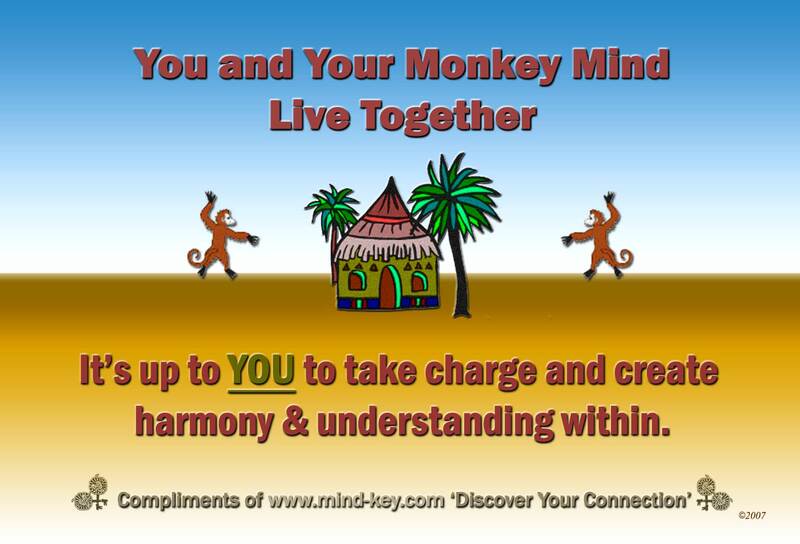 In the last article, I mentioned the Buddhist concept of the "monkey mind." Some evangelical Christians will have already turned me off due to the fact that I began with sourcing a Buddhist concept. More will write me off as I begin to talk about the concept of meditation as a means to overcoming "monkey mind." However, neither of these concepts should be foreign to the committed follower of Jesus Christ. Understanding both will give the believer a better understanding of the warfare in which we are involved. Do you ever find your mind jumping from thought to thought like that? And, if you look closely at the graphic, you can begin to understand why the carnal mind is at odds with God and godliness. There is nothing even remotely spiritual or religious contained within the ramblings. The problem is that the longer we allow this sort of existence, the more it takes root and begins to form itself into our personality. With that in place, it becomes even more difficult to extricate ourselves from its grip. In other words, we have allowed our monkey mind to wear a rut in our brain. Or, as Carol Dweck has demonstrated through her research, we develop a mindset. However, all is not lost. There is hope for the afflicted. The spiritual mind, as opposed to a carnal mind, is one that is set on spiritual things. Therefore, you can see that there are two different "mindsets" of which we can avail ourselves--the carnal, worldly, or fleshly mindset; or the spiritual, godly mindset. Another way of viewing the term of "mindset" may be to think in terms of paradigm or worldview. Regardless, the idea is that the mind is predisposed to filter or to categorize everything it encounters based on its predetermined awareness. You may have had the experience of talking with someone, making a comment or statement, and their follow-up comment seems to come from somewhere "out in left field," apparently having little or nothing to do with the subject you thought you were discussing. In other words, they are not able to hold a discussion point due to their mindset. This mindset thing affects everything we process, whether conversation, reading, or viewing. We will process that which enters our mind through our particular filter. Not only that, but we will also gravitate toward that which satisfies our particular filter. Now, can you see the danger, the ramifications? A carnal mindset will gravitate toward that which satisfies its carnal bent. A spiritual mindset will gravitate toward that which satisfies its spiritual bent. Now, if that is true, (and it is) then you can see the importance of developing a spiritual mindset. Changing our mindset from carnal to spiritual is really only a one-step process. It can be more difficult than one might imagine. We will look at those two steps in a future article. But first, we will look at Peter's paradigm shift and the necessity of maintaining a cognitive dissonance within our own minds. The doctrine of original sin is that all men inherited the guilt of Adam's sin and are sinners at birth. It gives absurdity a bad name to suggest that all men are born with a sinful spiritual DNA, of which they inherited from Adam and are therefore guilty of sin at birth. If men are born sinners, then they are born as fornicators, sodomites, drunkards, thieves, homosexuals, extortioners, murders, sorcerers, pedophiles and idolaters. Would God create men guilty of these sins, due to no fault of their own, and then condemn them to hell? If is not only irrational, but contrary to Scripture. Men are guilty of sin because they sin. They are not guilty of sin because of Adam's sin. Spiritual death spread to all men, BECAUSE ALL SINNED. Physical death spread to all men because Adam sinned. No one is guilty sin until they commit sin. The unborn and small children are not capable of committing sin. The doctrine of original sin is absurd, nonsensical, irrational, illogical, and most importantly contrary to the doctrine of God.